50 years of age and I ran a marathon - what charity challenges are ahead? : Dry July over – so what’s next? Get on the sauce and run some more…. 50 years of age and I ran a marathon - what charity challenges are ahead? Can a non runner go from 5k to a full marathon in a year? This blog was set up to track if I could go from a non runner to finishing a marathon within a year - well if you read the blog, that's now done, but what other charity driven insanities are on my path ahead? Can't stop at a single 42km (26 mile) challenge now can we? Dry July over – so what’s next? Get on the sauce and run some more…. So I successfully made it through July without an alcoholic beverage, in most cultures that wouldn’t be seen as much of an achievement. In Australia, where we celebrate each minor milestone with another ale, that is close to climbing K2. I’ll put some perspective on this…..”Mate, had a win today…..got to work without a train delay and then the cute barista asked me if I had a good weekend….wanna go for a beer to celebrate?” or “I hear the boys are playing Greece in a qualifying water polo match, if we win we are a chance of making the quarters…wanna beer to go watch?” or “I heard they upped the tax on alcopops??? What does that mean??? Wanna a discuss over a slammer or two?” These are general lift conversations that you would hear any day of the week in this country. There’s no “I’m feeling a bit tense, would you like to go to a yoga class” or “I think today’s been a bit tough, I’ll be leaving a bit early to have a quick meditation session”. Not our thing here in Oz. So how it works is, 31 days off the sauce is heralded as the equivalent of finishing AND understanding James Joyce’s Ulysses – it just don’t happen. What’s this got to do with charity? Dunno. What’s it got to do with running? Dunno (although the carb loading – that’s my excuse – did help me to a brand new personal best for the 5km run on Saturday where I finished in 30.39!!!). All up we raised $695 for the Royal Melbourne Hospital cancer patients so very happy to have done my bit (along with an anonymous team mate) by doing something for someone else. Here’s another “charity” tip – not one you’d usually call charity, but one that any person (within limits) can do. On Monday I headed off to our local blood bank and donated blood plasma. 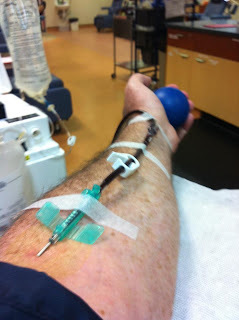 Costs you nothing, helps heaps of people and all up it costs you 1 hour of your healthy life and a needle prick. Not any inconvenience at all – in the grander scheme of being able to assist people with cancer, children with clotting diseases, burns victims, people undergoing emergency surgery, it’s not a lot to ask. And this specific day, all I did was set the alarm clock for 5am instead of 6am – although probably not considered as “charity” it is something that you can give and it costs you nothing. 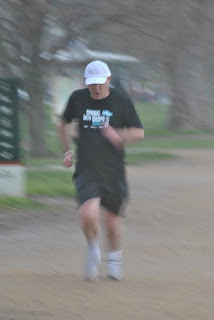 Running this week – as above did a new pb for the 5kms, that was after a 50 min run on the Tuesday, slow and steady it was after the 14 odd clicks I did on the Sunday, another 50 mins on the Thursday, a quick (get drenched) 5 kms on the Saturday and another “long run” of 14.32 on the Sunday. All of these were slow and steady, no speed runs or no hills….all bar the Saturday ParkRun. This one I amazingly cruised along for the first 2 clicks at 6 min pace and realised I was going okay so thought I’d just continue (what’s three more kilometres to a bloke who punched out 14 only six days before?) all was going to plan until the 4.5km mark when the heavens opened – now we are not talking a light misty rain that the English get, nor a hot tropical dump that you get in Asia or Florida or far North Australia, we’re talking similar volume to a tropical region but similar temperature to penguin’s bum. Did it make me run faster? Dunno, but it did make me gracious that I wasn’t wearing a white t-shirt. All up a 34km week and I still yet to get to my rants about running hills, conquering Mephistopheles, crossing the River Styx and more – I’ll keep those for the journey ahead….